Blip.fm is internet radio made social. It's easy to search for, play, and discover free music recommended by real people. 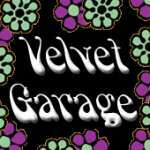 Join today to create your own free station and start listening to @VelvetGarage. The Sonics "Leave my kitten alone"
VelvetGarage This song is a heck of a lot better than Judy In Disguise. John Fred & His Playboys – Something's Going On. VelvetGarage Howdy @DJBadBilly Any song with "A Go Go" in the title is always fun. The Afex – " She's got the time "